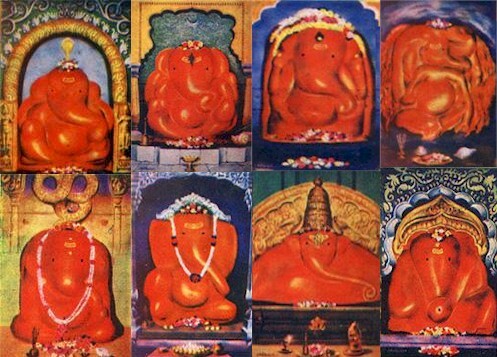 The Chintamani Vinayak temple at Thevoor is located in the vicinity of Pune. Thevoorcha Shri Chintaamani is considered to be one of the Ashta Vinayak shrines of Maharashtra, celebrating eight instances of legends related to Ganesha. The legend surrounding this temple centers around the Chintaamani gem. Sage Kapila was in possession of a gem by name Chintaamani which was capable of granting one's desires. He was visited by a young prince (son of Gunavati and Abhijita) by name Guna. The sage invoked the powers of the gem and created a sumptuous meal for the prince. The prince enamored by the power of the gem, stole it from the sage. A hurt Kapila Muni prayed to Vinayaka for help. Vinayaka restored the gem from the prince, however the sage refused to accept it, and began to rever Vinayaka as Chintaamani Vinayaka. Legend has it that Kapila Muni had received this gem from Shiva after worshipping him at Talaiaalankaadu near Thanjavur in Tamilnadu. It is believed that he had walked on his head to reach the shrine and hence the tamil name Talaiaalankaadu (talai - head). (Also see Kapilarmalai Murugan temple in Tamilnadu). The Temple: An east facing image of Ganesha, is enshrined in this temple which has interesting features such as gold inlays. This temple is closely associated with the Maratha ruler Madhavrao Peshwa.